Ad Visser was born in Amsterdam on April 28, 1947. After a short spell in the avant garde trio Blurp and working for several record companies, he becomes the face of the weekly pop programme Toppop, broadcast in the Netherlands between 1970 and 1985. In 1982 he writes the book 'Sobriëtas' with a soundtrack released on LP. 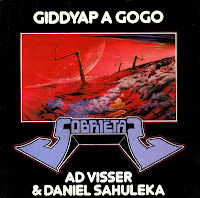 The single 'Giddyap a gogo', with guest vocals from Dutch artist Daniel Sahuleka, is taken from this LP, and becomes a surprise hit. The single peaks at number 26 in the Dutch Top 40 and Ad Visser actually presents and performs his own song on Toppop.